LIBERTY, Mo. — Drivers in Liberty, Missouri, will start to see the impact of a major road construction project this weekend. 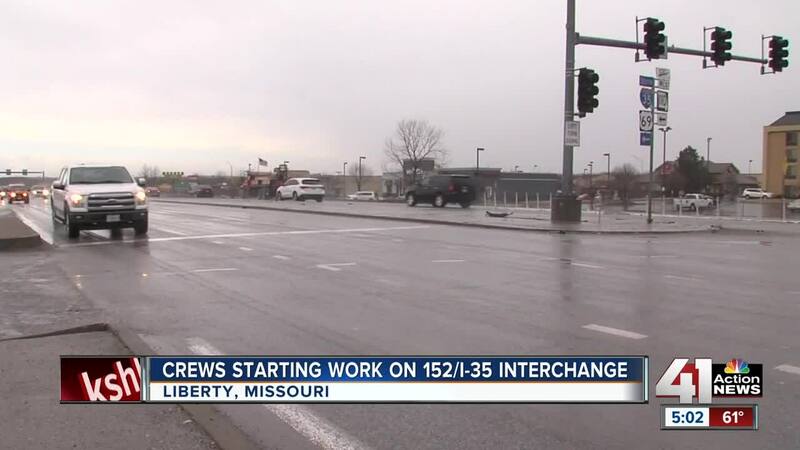 The Missouri 152 (Kansas Street) and Interstate 35 interchange will be under construction for the next year and a half. This weekend, crews will shut down lanes on southbound and northbound I-35 to start removing pavement to make way for new lanes. “It’s always cluttered, people cutting off. I think widening it is going to help tremendously,” said James Schroeder, who lives in the area. The interchange always seems to be congested. “And any sort of traffic issue really backs up traffic, and typically it will back it up onto the highway, which is not a safe situation. So we're trying to address those issues moving forward,” Liberty Director of Public Works Andy Noll said. The project will cost $30 million, with funding to be split between Kansas City, Missouri, the Missouri Department of Transportation and Liberty. It will widen the highway and the bridge and add turn lanes. When school gets out in May, the Missouri 152 bridge will shut down for four months. The project is expected to be done by September 2020. Drivers will need to use alternate routes during the construction. “There will be no connection between the KC side and the Liberty side, so people will have to use (Missouri) 291 or the Pleasant Valley interchange or find other routes to get where they're going,” Noll said. People who live in the area worry about the problems the construction could cause. “That's a long time, and then added to that, the other streets are already starting to become congested because they're already trying to find other routes so that'll make it a lot worse,” Neffie Wilson said. Once the project is complete, drivers will go through what's called a "displaced left turn." And really, there will be two bridges. “You take the eastbound traffic that wants to turn north on I-35, they shift that before they even get to the interchange, and shift it to the northern smaller bridge and they will be able to free flow,” Noll said. The area has grown in the last 15 years, and officials say that’s why the project is needed. “It’s amenities for people so they don't have to travel further to go shopping for hardwares or groceries or go to restaurants. It’s also a standard of living for community,” Noll said. The interchange sees between 46,000 to 50,000 cars daily. Noll said traffic is expected to rise to 84,000 cars daily by 2040.